An embarrassing game again for team USA. Two bad calls in two games, only one win even with the help of the umps. I don’t live in the US and I could tell you that team USA in our country is being called sore losers. I hope in 2009 international umps are used or at least get some US umps that will help you WIN in all the games. It is unfortunate that an umpire gets this much attentions instead of the players from around the world. Therefore the under-qualified umpire like him should go back immediately to his previous job: softball games umpire for $20 a pop. Mexico VS USA had me on my toes all night!!! I can tell you outright that neither Korea or Japan will best either Cuba or the Dominican Republic head to head. Team USA failed because it lacked the hunger to win, a hunger that is more than personal pride, more than country pride, it’s the need to give back to the people at home a crown they know it’s long due: Beisbol! No other countries in the world have the passion of the Caribbean fans, they push the teams to do the impossible and more! Team USA lacked the heart of fire to win, it had the weapons, the bullets but not the never-give-up soldier behind them! The only real time Cuba lost to a team in real play was to the Dominican Republic, quite simply the game VS Puerto Rico was a gimmick to fill the programme, Cuba and Puerto Rico had already clinched their spots for the next round. Cuban player didn’t play to win at all at that particular game, just to get by for the next meeting. Puerto Rico’s win over the Dominican Republic was due to lack of pitching on the Dominican side. Cuba could upset the Dominican Republic but it will be hard to do at this point, most hitters already faced Cuba’s arms and watched the tapes from the earlier Cuban games, so don’t think these guys get pay the big enchilada for nuttin’. So lets find out how good my observations are tomorrow! Sadly, the USA was the only country at the tournament not treating this event with respect it deserves. While only a handful of international players pulled out of the event, plenty of US players did. Also, Buck Martinez was far more concerned about getting players playing time than he was about winning games. I really think Buck was an absolute disgrace. Why was he the manager? Japan is being managed by the greatest player in the history of the country, while the USA is being managed by someone whose only managerial experience was an absolute failure. He had Jeter, Varitek and Griffey out of the game against Canada when the score was 8-6, and didn’t have Varitek in until the 8th inning yesterday. This isn’t meant as an excuse. Even with all their best players and a real manager the US might not have reached the semi-finals. I really think this tournament is wonderful and I hope it becomes a big part of baseball in the future. I hope Korea will get past Japan one more time, who is considered second in the world in quality of the league behind MLB. Remember Ichiro broke an 80 year old record of most hits in a single season in MLB and among the top hitters year in and year out. I don’t see how some people think Careabean teams are better than Asian teams head to head. Before this tourney, I believed that Japan was considered second best team behind USA and not DR or PR or Cuba. And Korea beat Japan twice this tourney and is undefeated so far. All in all, the most important factor in baseball is pitching and Korea ‘s got pitchers… We shall see who wins it all tomorrow and Monday night. May the best team win. Viva Corea!!! Thanks Bob for the page everyday and the blog. I enjoy reading everyones comments and ideas. Again I just want to say if the USA wants to win an event like this in the future I hope they start planning today on how and ways to win. We should not have to rely on our own umps to try to help us win. Again like someone just said even if we had better players like Bonds, I am not so sure Buck Martinez would of even had played him in the spots most needed. I also feel Buck was only trying to get players in the games because yes they did choose to voltner thier time to come and play. But again if we are going to ever win we need a better manager and smarter players not just good players but smart players that know how to win as a team and at least know how to lay down a bunt, yes I am talking to you Mike Young. We never had a leadoff type hitter either. Jeter had 9 hits but only 1 RBI. Jeter should had been our leadoff hitter. I vote for Tommy to manage the team in 2009. I agree with everyone that in the simis the two groups should switch. I think its not as exciting to watch Japan and Korea 3 times against each other. Its crazy to think if Japan beats Korea they will get to play in the finals after lossing to Korea twice and for Korea to go home with only 1 lost. In 2009, if we cant vote for our team to represent us then at least let us vote for the Manager. Again I vote Tommy in 2009. ALso, getting to play in this event like this should be an honor not just a volunter thing. A player should have to earn his spot on the roster. He should get a golden letter, like a golden ticket in the mail sent by MLB saying you have been pick to repesnt your country in the greatest game ever. There are reports in the DC media that DC mayor, Anthony Williams, will meet with Bud Selig on Saturday at the WBC. How likely is it that we will get a decision on a time-frame on an announcement for a new ownership group for the Nationals? Dear Mr. DuPuy – No small part of the success of the WBC has been your wonderful blog – thank you. I’m a lifelong baseball fan and I am going to watch all the final games even though the USA has been eliminated, because of the quality of baseball being played in this tournament. I’m posting part of Thomas Boswell’s column from the Washington Post this morning which speaks to that issue. “MLB can thank its lucky stars for March Madness. If the nation had not been busy with its NCAA basketball brackets, it might have noticed that teams from all over the world now know how to emphasize pitching, defense, “small ball,” team play and high spirits, while our players sat back and waited for guys with big muscles and bigger salaries to hit home runs. The message of this first, but not last WBC, may be clearer than we think. For more than 15 years, MLB’s brand of baseball has been long on “juice” and short on subtlety. That era is finally over. Teams like the Chicago White Sox, who play the whole game properly and function as interlocking units, not as isolated individuals, now rule the sport. Glad you are back Bob. Here are a few thoughts. 1. Its not too late to use foul line umpires at least for the final game. I am sure there are two Major League category umps living in Southern California willing to take a trip to San Diego and participate in the WBC’s final. I am sure you could find a way to make it worth wile for them. You would give the tournament the respect it deserves, more credibility and, to the eyes of the world, start making up for what wasn’t done before. A sort of: “hey, we screw up with some umpiring calls, but look, we are already taking steps in the right direction” I think it would go a long way. 2. Maybe the next WBC we can have instant replay like they do in football for field calls. I am not talking about balls and strikes, but for an occassional bad call like the ones made against Japan and Mexico. 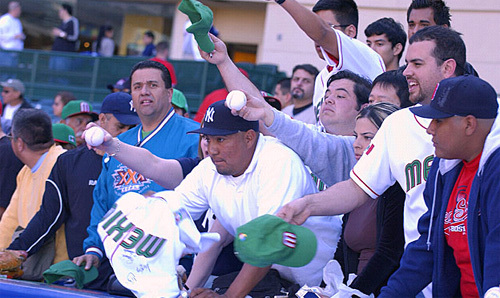 The WBC doesn’t have to follow every MLB rule. 3.The best players and coaches should play in this thing, period. Either by a vote or by a national coach that picks them. If they don’t want to play, let them be exposed as the greedy, selfish, unpatriotic lowlifes they are. The fans in the stadiums will remind them every chance they get. Let’s see if they don’t want to play now. 3. Great thing about the ESPN polls, but now there has to be a follow up and renewed effort to get more countries interested in the sport. The US doesn’t have to do this by themselves. We now know that there are other great teams out there. Maybe we can get the Cubans, Koreans, Mexicans, etc. to go play exhibition games to some of these countries with baseball potential. With the exception of Cuba, the other teams won’t be exactly the same caliber, but the intention remains. Anyway, thanks for writing this blog. I am in San Diego, it is saturday morning, and can’t wait to make it to the ballpark. The sun is peeking through. The excitement is mounting now – heck I was excited yesterday! A point on the US. A lot of flack for Buck Martinez (who won 1 of the 3 US games) and the players here. Understandable but I think wrong. Buck and all of those players were willing to stand up put on the US jerseys and play in a tournament where defeat would be world news and victory greeted with ‘so whats’. They deserve praise for that at least. US fans might turn their attention to those who SHOULD have been there but were not… I hope that in 3 years the entire US baseball establishment will be ready to work to ‘put this one right’! 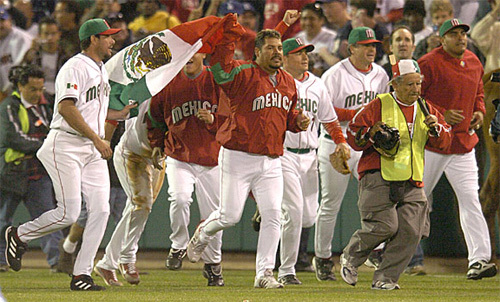 I don’t blame any player that did not want to participate in the first wbc. I do believe that more players will be interested in playing after seeing all of this year’s WBC. The comments about USA..lacking passion for basball..is totally false. The American players tried hard, but they just couldn’t succeed. Buck Martinez did a good job, if he was winning, everyone would be praising him. In this type of tournament..anyone can win. Bob Davidson made all the right calls from his viewing points, he does not have the access to replays. yooj – on anyone being able to win a tournament like this. Up to a point, maybe. A team can have a dream few weeks and win. However, lets look at the last 30 years since international baseball came together. In the Olympics, World Cups and Intercontinental Cups there have been 28 events. Cuba have won 24 and been second the other 4 times. In the last 19 European Championships – generally 8 or 12 team tournaments – the Netherlands have 12 and Italy 7, the rest none. Well the first semi lived up to its billing – a fine game and congratulations to Cuba. Last week a lot of folk commented that this was the Cuban second-string. Thank goodness they didn’t send the good players! To be serious, they do seem to have another gear when they know a game is a must-win. Whatever you do, you have to watch the Cubans warm up before a game. Then, and only then, will you understand why they are so good. It boils down to fundamentals, and the Cubans are masters at it. Nice to see their approach to the game…its fresh, crisp, unspoiled; it was a treat I will never forget. Thanks to everyone who put this tournament together. Hey, Bob, you want an idea for a sure bet sold out game? How about the Yankees vs. the Cubans? I am not so sure the Yankees could pull it off…and the whole country would be watching. I was at the first WBC game here in the States (Dominican Republic vs. Venezuela). It was by far the most exhilarting sporting event I’ve ever been to. The fans were tremendous. I liken the players to kids in a candy store; they were so happy and energetic. Emotions were running high from the moment we walked into the park – actually from the time we got out of the car. I have to admit, though, that I am not as excited about the upcoming MLB season. Here’s why: the excitement and intensity that I saw on the field, in the dugouts, in the bullpen, and in the stands at Disney won’t be there in the major league ballparks. I think we, in the U.S., take baseball for granted. Its just assumed that we are the best and no one can touch us or share the love for “our game”. So, I’d like to challenge all of the true fans to go out and support your team the way the fans supported their national teams in this tournament. Paint your face, wave your flags, party in the stands. Just bring the joy back to the game. Baseball is more than the “Kiss Cam”, 7th Inning Stretch, and crowd crews throwing free Ts or towels into the stands. Why should the organizations entertain us? Let the players and fellow fans to do that. “Party in the Parks” this year, folks. I dare you. As a retired US Marine, I have been watching the WBC from Japan and I have to say – WOW!! What a great idea this was. Kudos to all involved. Although I have not been able to watch every game, the excitement of the fans, especially the S. American, Carribbean and Asian fans just goes to show how international this game is. It also goes to show just how falsely arrogant many of the U.S. fans and players were about this from the get-go. OKay, so next time around lets stow the pride and play some ball. ****, we invented it, we should be able to get to the semi-finals at least. At any rate, this was a great tournament and I send best wishes to both the Cubans and the Japanese as well as to every player, coach, umpire and fan who made this possible. Ooorahh international sports!